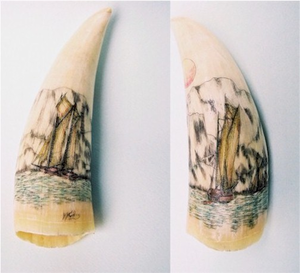 This interesting Sperm Whale's tooth is scrimshawed 360 degrees all around. It tells the story of three ships trying to find a safe anchorage on a rockbound coast at sunset. The concave side is etched with a an early 19th century topsail schooner. The convex side shows an early yawl-rigged ship, as well as an early topsail ketch. The tooth is in light color, with blue/green seas, brown hulls and yellow/tan canvas sails. The coast is done in shades of grey, and the setting sun is yellow and orange in a cloudless sky. The tooth is 6 inches along the curve and stands 5 3/8 inches tall. Its base is 1 3/4 inches wide. It weighs 179 grams. This tooth is, of course, legally sold - It is registered with the U.S. Department of Commerce as #21-231-0006. A handmade Sterling Silver base, made especially for this tooth, can be yours as an additional option, or choose the option of a wooden spindle base. This splendid tooth is a great treat! A unique piece - Of course, only one is available.